Geeky Cakes | Pushing the limits of ingredients and construction. Irish cream liqueur is a great pairing with rich Chocolate Stout Cake, but for those who don’t consume dairy, you’ll need to craft your own. 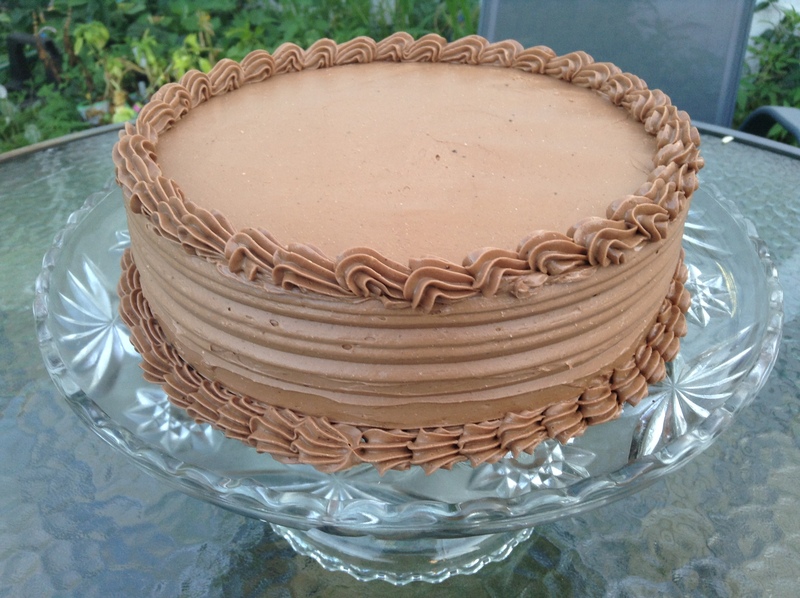 This recipe adds Irish whiskey, cocoa, and coffee flavors to creamy Vegan Italian Meringue Buttercream to mimic this classic favorite. Many thanks to Nina from Plante Pusherne, whose Vegan Irish Cream recipe provided great inspiration. This version is darker in color than what you might get if you use a commercial Irish Cream. You can use less cocoa and espresso powder if you want a lighter color and a more subtle flavor, but use the full amounts if a tan icing is OK with you, and you really want the flavors to come through. 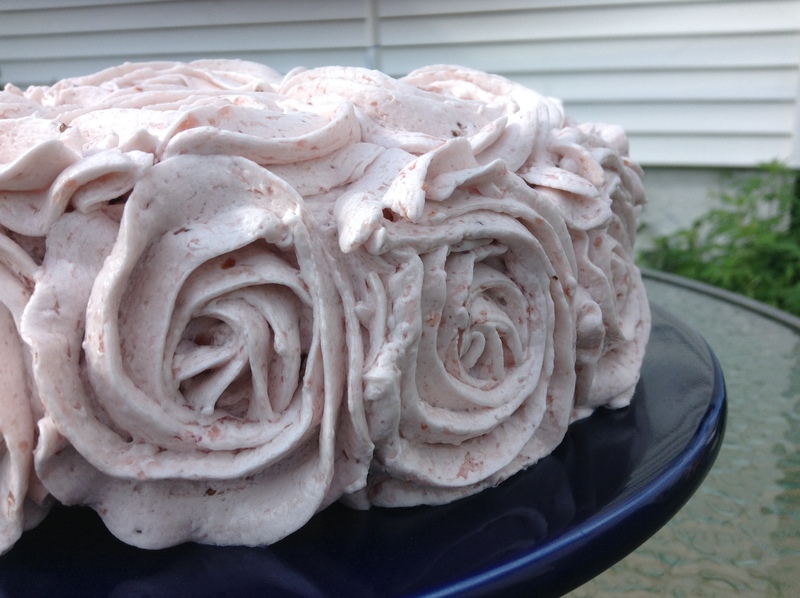 Make Vegan Italian Meringue Buttercream according to the recipe, setting aside half of the batch for another purpose. 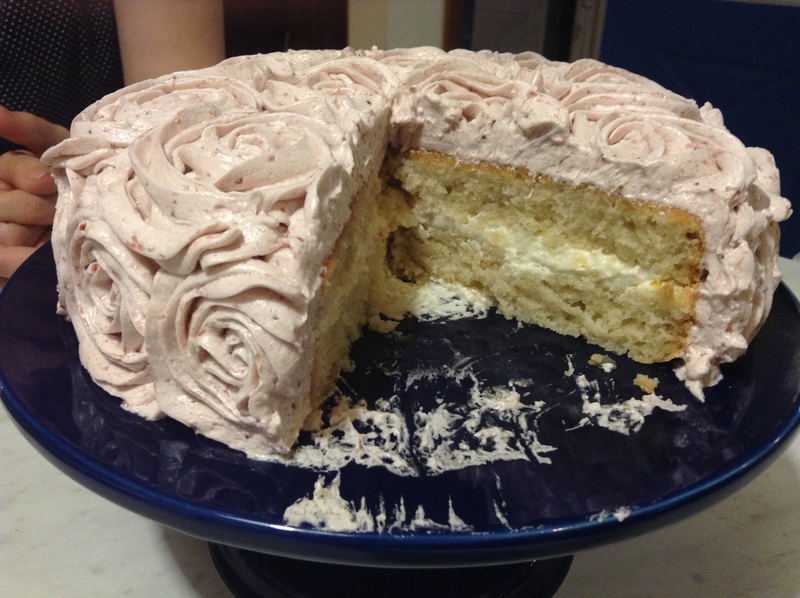 You should have approximately 4 cups of buttercream for this recipe. Add Dutch process cocoa and instant espresso powder in the Irish whiskey, stirring well to fully dissolve the powders, and remove all lumps. Add the whiskey mixture to the buttercream, and mix well, ideally using the paddle attachment on a stand mixer. Chocolate stout cake is one of my favorite variations on chocolate cake. Rich, chocolate-y, and not too sweet, it tastes great paired with poured ganache, vanilla, chocolate, or coffee Italian Meringue Buttercream, or even just whipped cream (add Frangelico or other tasty liqueur for a delicious variation. For those not familiar with chocolate stout cake, no, it doesn’t taste like beer! Just as brewed coffee is sometimes added to a chocolate cake without giving it a coffee flavor, stout can add depth to the color and flavor of a chocolate cake. I absolutely love the chocolate stout cake recipe from Barrington Brewery in Great Barrington, Massachusetts, which is filled with eggs, butter, and sour cream. Of course, not everyone eats dairy or eggs, so I set out to re-create a suitable vegan alternative. Rebecca August’s excellent Chocolate Midnight Cake recipe as posted in the Vegan Meringues — Hits and Misses Facebook group made a great starting point. This recipe is a merging of the two, and I am happy to say that it stands up nicely against it’s dairy- and egg-containing cousin. Makes one 8-inch layer or two 6-inch layers. * Note that not all stouts are vegan. Do your research to find one that suits your needs. Add cider vinegar to milk and stir. Set aside to allow it to curdle. Grease one 8-inch or two 6-inch round cake pans with 2-inch-high sides. Line with parchment paper, and grease the paper. Bring stout and coconut oil to a simmer in heavy medium-sized saucepan over medium heat. Add cocoa powder and whisk until mixture is smooth. Cool slightly. Sift flour, sugar, salt and baking soda into a medium-sized bowl. Add milk and aqua faba to the hot stout mixture, and whisk together. Pour stout mixture into dry ingredients and whisk gently until just blended. Bake at 350ºF for 30-35 minutes for 6-inch pans or 37-42 minutes for 8-inch pan. Check early and don’t over-bake, but also take care not to under-bake. This cake is done when a toothpick inserted in the center comes out clean and the top springs back when pressed lightly in the center. Transfer cake to a cooling rack and cool 15 minutes. Don’t rush this! The cake will be quite soft when it first comes out of the oven, and will require some time to set. Gently turn layers out of the pan and onto a rack. Cool completely. 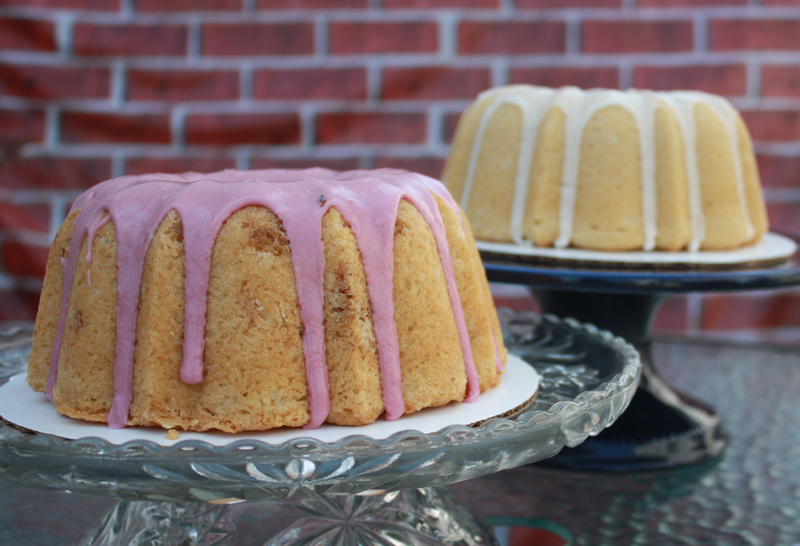 Did you know that you can fill a bundt cake with lemon curd, by baking it right in? It’s as simple as starting with half the batter, adding the lemon curd, and adding the rest of the batter on top. Each slice will be filled with lemon-curd-y goodness. and they were eaten too fast to get a good photo shoot! 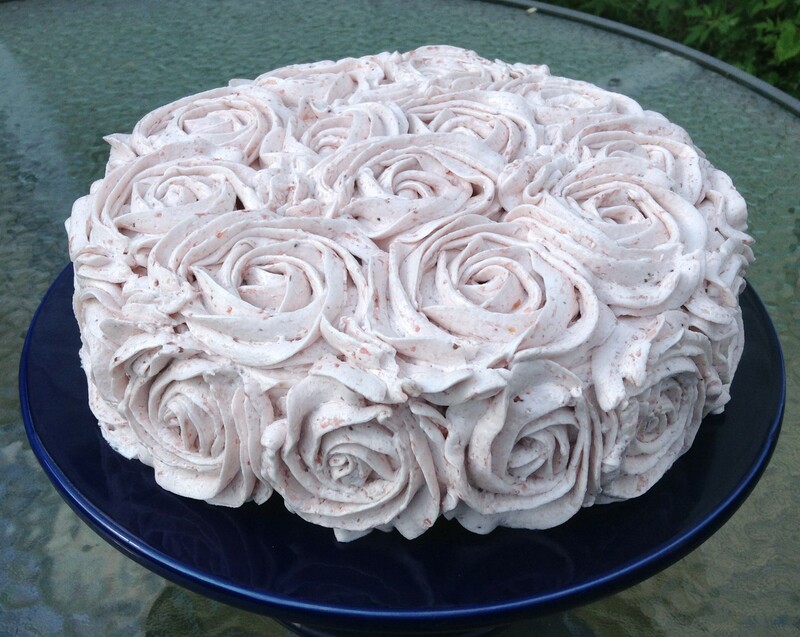 Vegan Meringue – Hits and Misses Facebook group. Preheat oven to 350°F. Generously grease a 6-cup (not 10-cup!) bundt or tube pan. Mix together milk, lemon juice, oil, aqua faba, and extracts. Set aside to allow the milk to curdle. Sift the dry ingredients into a medium-sized mixing bowl, and mix well. Pour the wet ingredients into the dry ingredients, mixing with a fork or whisk until well combined, but do not overmix. Use a rubber spatula to be sure that all the flour in the bottom of the bowl is fully incorporated. Pour approximately half of the batter into the prepared pan, pipe 1/4 cup of lemon curd in a ring on top of the batter, keeping away from the edges of the pan. Top with the remaining batter. Bake until a cake tester inserted in the thickest part of the cake comes out dry, and the surface of the cake springs back when pressed lightly, approximately 45-50 minutes. Be careful not to under-bake. Cool for 10-15 minutes before removing from the pan, then turn out onto a wire rack and allow to cool completely. 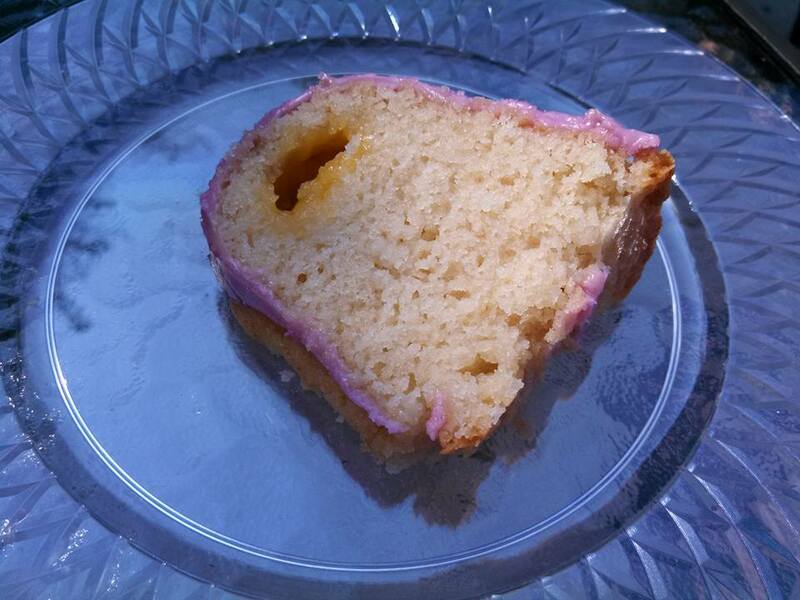 When fully cool, mix together confectioner’s sugar, vanilla extract, and enough lemon juice or blueberry puree to make the glaze a pourable consistency. Drizzle the glaze over the cake, and allow it to set. of a 5-year-old birthday boy. The bottom sphere is Rebecca August’s excellent Chocolate Midnight Cake, and the chest and head are Rebecca’s vanilla cake, baked in mixing bowls to make hemispheres. It’s iced in vanilla Vegan Italian Meringue Buttercream and covered in sweetened, flaked coconut. 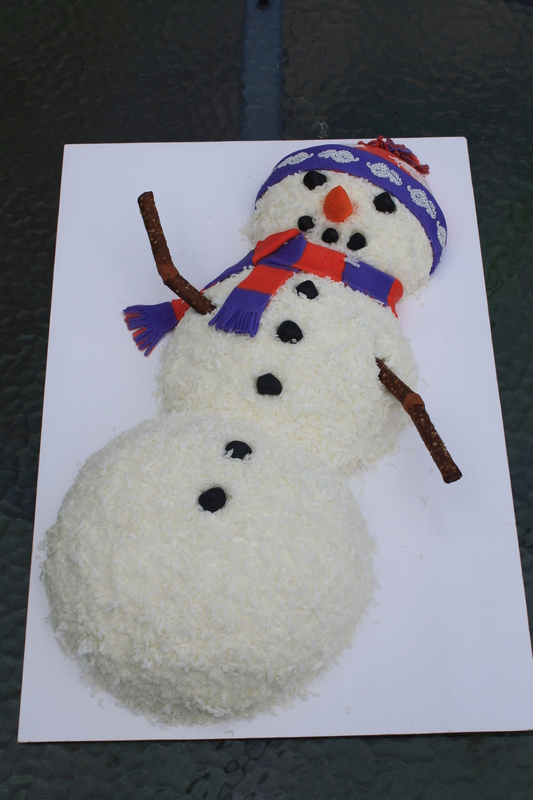 The snowman’s hat, scarf, and carrot nose are made with marshmallow fondant (make sure to start with vegan marshmallows if you want a vegan cake), and adorned with vegan aqua faba sugar lace — watch this space for the recipe! The snowman’s coal features and buttons are made of marshmallow fondant brushed with black luster dust for a coal-like shine. The arms are pretzels joined together with a bit of vegan gumpaste, and I used a clay extruder to make the pompom on top of the hat. 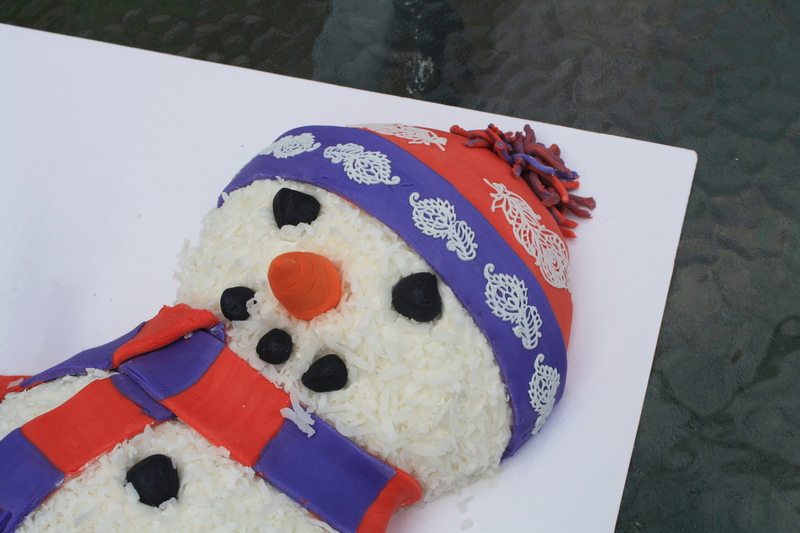 There is always a risk with cakes like this, and there was a small mishap at the party when a young guest put a finger print into the snowman’s face, because he didn’t realize it was a cake! It got fixed on the spot, though, and both kids and adults enjoyed the cake. I’ve been working really hard on a recipe for a vegan chocolate stout cake. The current version tastes delicious, but the texture just isn’t right yet, so it’s really just not ready for prime time. I had some leftover chocolate Italian Meringue Buttercream from my daughter’s birthday party, so I decided to frost the latest incarnation. It might as well be pretty while you’re taste-testing, right? I recently tried out Rebecca August’s wonderful Vegan Vanilla Cake recipe, which has a really lovely texture. I had some lemon curd and strawberry Italian Meringue Buttercream left over from previous projects, so I filled it with lemon and iced it with strawberry. 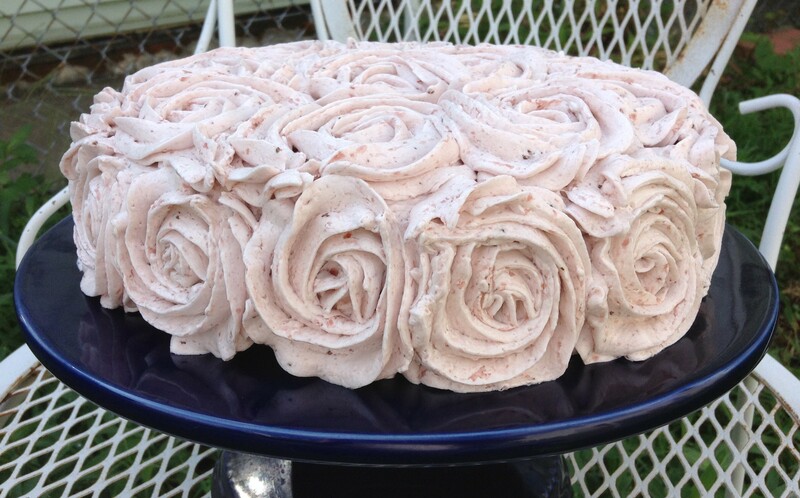 Rose swirls are fast and easy, yet fancy.